Thanks for Bookish First and Sourcebooks for providing this ARC! It will be published September 18th. I was super excited about this book and have been since hearing about it. So, when I saw it was up on Bookish First and I could redeem points to get it, I decided to go for it and get it. I mean, why not! It was a great opportunity! Sadly, the book wasn’t for me. One thing I suggest is to not read the synopsis. It gives too much of the book away. Things that were just discovered where I was were in the synopsis, which ruined it for me since I was waiting for some explanation. It also encompasses a genre I don’t like. Any guesses? It’s a mystery, but it’s also really fantastical (or sci-fi; who knows) in that there’s some kind of magic or technology system. And it’s never explained? It’s never clear what’s going on, what the reason is, or why I should care about it. And that was the issue. I didn’t care. The characters were bland and forgettable. 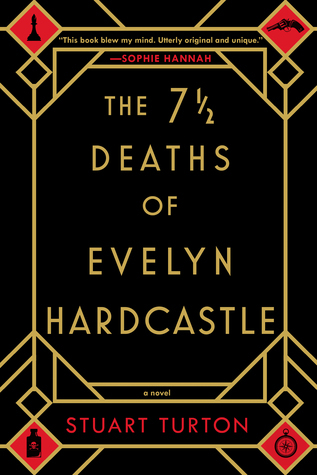 The only character I was excited about was Evelyn Hardcastle, but she’s barely on the page for a book titled after her. It’d be like if Evelyn Hugo wasn’t a huge character in The Seven Husbands of Evelyn Hugo. This required me to suspend my disbelief, something I don’t do well with books set in a world that’s basically ours. I also hate magic systems that have no explanation. Combine both those things and I knew it wasn’t going to be for me. And I picked it up with the intent to read it and I found that I seriously couldn’t be bothered. Sadly, a DNF for me. Since this was already published and this is an ARC for the US copy, have you read it? This is the first! Because I’ve heard so many great things about this book, but I can totally see why you didn’t like it! Thanks for the comment! Yeah, it was a sad miss for me. I’m glad so many people enjoyed it, but the book just wasn’t my type. Yeah I know what you feel. But I think I’m still gonna give it a try though. I hope you enjoy it when you give it a try! I know lots of people really liked this one. I hope so too, thank you! !